Paul did a wonderful job! My kitchen floor looks brand new. It is a very small marble pattern with two colors and lots of grout. Great price, perfectly on time and very clean. Aside from doing a great job, I was impressed with how well Paul communicated throughout the process. He returned calls quickly, sent the estimate right away, I knew when he was en route, etc. This is a very reputable company, clean fast. We had our 20+ year old travertine shower and floors re done including grout, Wow! !, is all I can say. I honestly can say I recommend this company. Paul provided such excellent service at our house today. 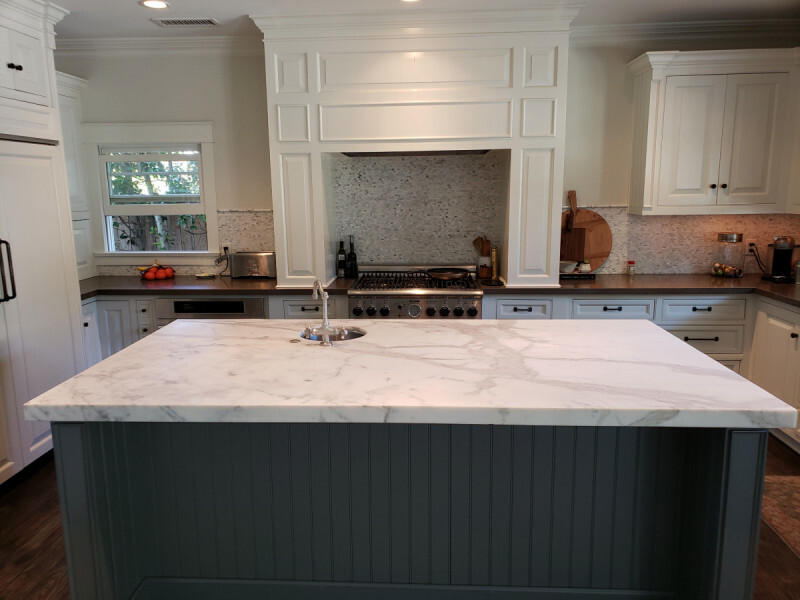 I contacted him regarding our granite countertop that had some oil stains around the cooktop, and cracked grout at the sink area. Paul was on vacation when I initially contacted him but he replied promptly, letting me know when he’ll be back in town. After sending photos and talking over the phone, we set the appointment. A couple of days after, I noticed our shower grout/sealant is peeling away from the edge of the shower as well. He ended up cleaning our kitchen countertop, sealing the countertop with a permanent sealant, and fixing the grout in our two showers! He is very methodical and I appreciate that he tells me what he’s working on as he’s doing it. Another plus, I like that he sets clear expectations at the beginning. When he saw the oil stain on the granite, he told me he’ll try his best to remove but he can’t guarantee the stain coming out completely (stain type, length of time stain’s been there, etc.). In the end, the stain had lightened considerably and I am very satisfied with the work. I appreciate his honesty. We’ll be contacting him soon to clean and seal our tile floors! Thank you Paul for a great job and a wonderful service! We called Affordable Stone Care to see if our travertine floors could be saved by cleaning and repairing, or if it was time to take them out. They assured us they were definitely worth it, and they were right! Our floors look brand new again, and the cost was very reasonable! Would highly recommend affordable stone care. Paul was friendly and professional. Very knowledgeable and did a great job with the marble on our island. Came out looking brand new! Marble counter top restoration. Marble counter top repair included removing, scratches, stains and etches. Finish changed from polished to honed.